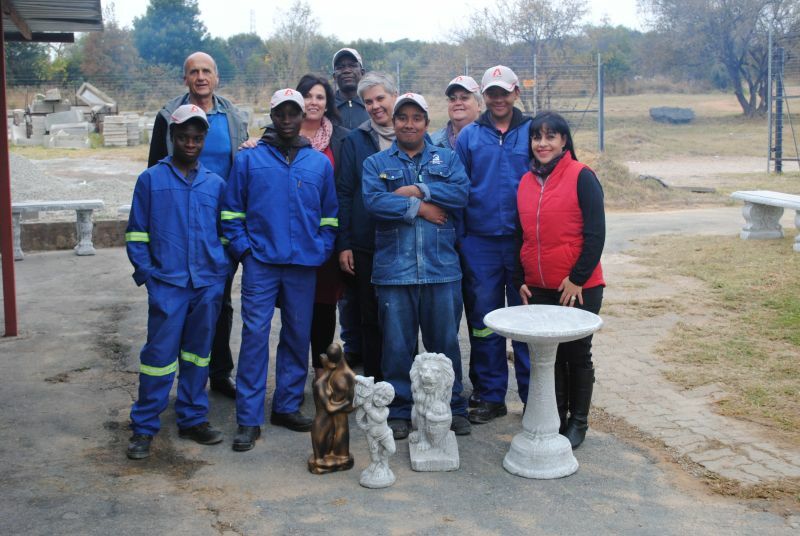 Pupils at The Gateway School, a leading school for special education needs in Roodepoort, were recently empowered in the art of concrete formations. Through a structured mentorship programme undertaken by precast concrete manufacturer Caleon Garden Creations, pupils are given the opportunity to create their own art using concrete. The Gateway School’s focus is helping pupils with special needs to achieve their full potential, which includes empowering them with the skills and knowledge they need in the world of work. In doing this, the school often partners with corporates to expose the pupils to various skills and partnered with Caleon Garden Creations for the last four years. AfriSam recently came on board to support Caleon Garden Creations in this worthy cause. In the programme, three or four pupils are taken in at a time, and the management and employees take these youngsters under their wing. With a factory in Rietfontein, Caleon Garden Creations manufactures a wide range of concrete products such as tables, benches, pots and water features. Its products epitomise creativity and artistry in the use of concrete. Caleon Garden Creations owner Ferdi de Wit said the initiative was the company’s way of contributing to the upliftment of society. For Caleon Garden Creations, this initiative to teach learners new skills in concrete creations is one in which all employees proudly contribute.